“You can hold a rock concert, and that’s okay. And you can hold a ballet, and that’s okay. Just don’t hold a rock concert and advertise it as ballet.” ~ Warren Buffet. Each year there are notable yield traps. In 2012, it was QBE. During 2012 to 2014, some consumer stocks turn out to be yield traps including David Jones and Myer. The year 2015 saw mining services stocks take an axe to their dividends, including Monadelphous and WorleyParsons. In 2016, BHP’s progressive dividend policy was scuttled and Woolworths and Origin Energy also cut dividends. In 2017, Telstra, the king of all income stocks slashed its dividend. The year 2018 saw Myer suspend its dividend. As we look forward to FY19, are there any more yield traps on the horizon? From an earnings perspective, the outlook for National Australia Bank (NAB) is relatively benign (barring a recession). Hence, superficially it seems that their dividend is sustainable. However, NAB is walking on a tightrope in managing high dividend expectations. With the weakest balance sheet and highest payout ratio compared to the other major banks, there is little room for error for NAB. Based on Australian Prudential Regulatory Authority’s 2020 target capital (CET1) ratio, NAB is the only bank that currently has a capital shortfall. Given that NAB’s ROE is relatively low and its payout ratio is high the company is simply not retaining enough earnings to replenish its balance sheet. A tight balance sheet makes it difficult to tolerate even small shocks to the business. In a volatile world, management may be forced to protect the balance sheet rather than maintain the dividend. Telstra has taken the headline as one of the biggest yield traps in recent years and unfortunately will continue to do so in FY19. 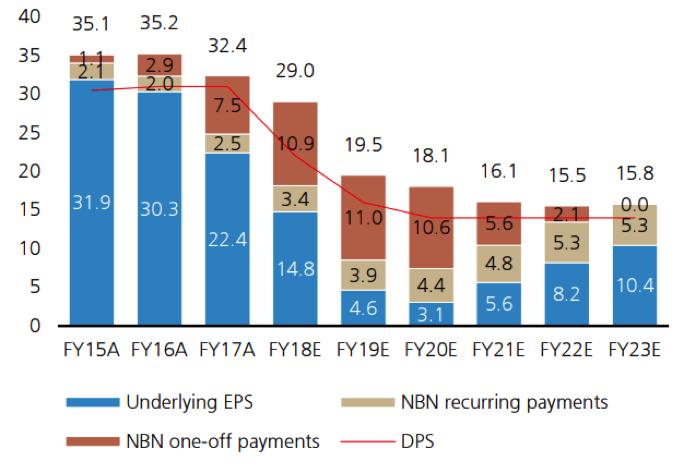 Despite Telstra having a strong balance sheet, in 2017 the company revealed that the NBN would gouge giant earnings hole in the future. This was the key reason why Telstra rebased its dividend from 31 cps to 22 cps. Dividends are an essential component of investment returns, but chasing yield can be a very dangerous investment strategy. Investors need to avoid yield stocks with high payout ratios, weakening balance sheets, and/or peak cycle earnings otherwise they are picking up pennies in front of a steamroller. If the dividend is under threat one will need the nimbleness of a ballet performer to exit just in time and avoid being steamrolled. Not everyone is that light-footed and for many it can be an unwelcome investment hell.